Note: The early bird discount of 20% ends today. to register. 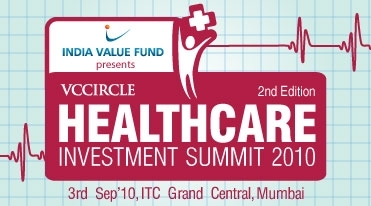 In its second edition of VCCircle Healthcare Investment Summit 2010, we bring to you the best business models in the healthcare and diagnostics delivery space. What is the right healthcare delivery model for India-Hospitals like Apollo or Fortis, specialized chains like HealthCare Global or a combination of both? What are the challenges to scaling diagnostic delivery chains? Are investors prepared for long gestation play in healthcare particularly mainline hospitals? Are doctors willing to handle power point presentations along with their steths? Is real estate one of the biggest challenges to scale in healthcare delivery? Are Indian hospitals chasing the Asian story? Whether you are a primary, secondary, tertiary or specialized healthcare provider, these are answers that can impact your future plans. VCCircle’s special panel discussion on constructive engagement thoughts between medico-entrepreneurs and investors will shed light on what to look for and how to present your case while seeking investment. Sanjay Singh - Founder, Swas Healthcare Pvt. Ltd. Early bird discount of 20% ends on August 10. to register.